The deadline for admission to the M.A. in Philosophy program is March 11 previous to the Fall semester of entry. Applicants to the program are expected to have a solid undergraduate background in philosophy as a basis for advanced graduate study. The M.A. 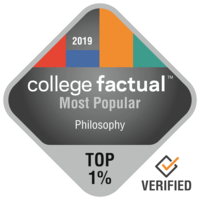 in Philosophy is independent of the University of Arizona Philosophy Ph.D. program. Students completing the M.A. in Philosophy will be given no special consideration relative to other applicants if they choose to apply to the doctoral program. The MA in Philosophy does not have a thesis requirement. A student may, however, opt to write a thesis instead of taking one of the graduate seminars. For a petition to be successful, the student must secure a faculty member to supervise the thesis and two other faculty members to serve on the thesis committee and conduct an oral defense. In such cases, the thesis will be a paper of approximately 6,000-10,000 words.